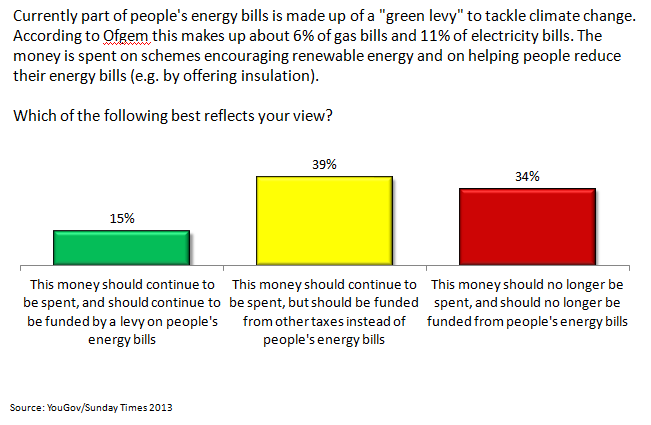 A glut of polls this week has shown more clearly what the country thinks about government levies on energy bills. The results tell us both why the measures are under attack, and also how environmentally-conscious politicians can protect funding for renewables. Together these two points look a bit like what Hopi Sen calls ‘pony polling’: would you like something nice (that someone else will pay for)? 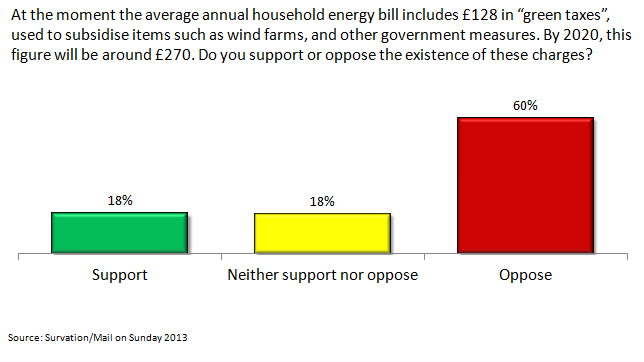 So there’s a specific problem with support for renewables. People want renewables to be expanded, but not so much that they’re actually happy to pay more themselves. 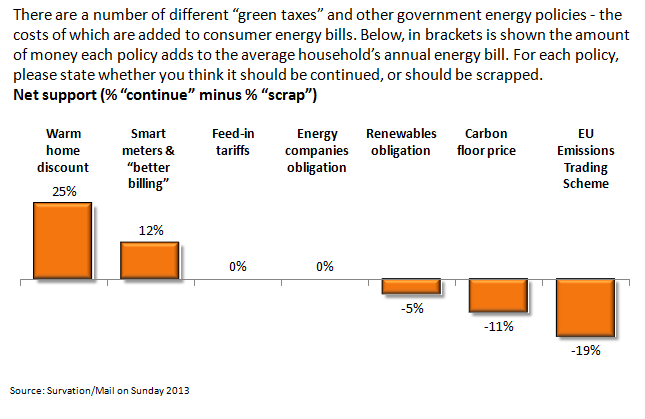 With the parties agreeing that energy bills are too high and with the scrutiny on the government levies, it’s likely that the levies will be changed, though from the chart above, the social measures should be secure (it would be a massive own goal for the Tories to remove another measure protecting the poor when it doesn’t help with deficit reduction). But the question is whether, after any changes, funding for green measures will survive (through some other means), or if they’ll be cut by a government that reckons it gets more credit from reducing the cost of living than it gets opprobrium for abandoning efforts to be green. For those who want to stop the green measures losing their funding, there are a couple of arguments that I think can be made. How much cheaper bills will be if we expand renewables rather than continuing with as much gas, coal and nuclear. What climate change will mean for the UK – ie you, your family, your community ­– if we don’t tackle it now. These are already being argued to an extent, but can be said with much more clarity, consistency and volume. Secondly, the way renewables are paid for needs to be made visibly fairer. Everyone in the UK benefits from the state education system (directly and indirectly), but we don’t expect it to be funded through pay-per-use. Instead, we expect that this common good is paid for through a progressive tax. So funding for renewables looks like the weakest link in government levies on energy bills. Support for it is stronger in principle than when people are faced with the reality of what it costs. The benefits aren’t really being made clear. An anti-green politician might make the case that we should scale back our support for renewables for a few years for the sake of cutting people’s bills. But there’s a widespread gut feeling that it’s right for the UK to tackle climate change and switch to a less polluting renewable energy supply. Arguments for supporting renewables will reach an audience that’s prepared to listen – but those arguments need to be made, or there may not be enough of a political cost to stop the government abandoning its green commitments. * This is a really important result and challenges the common view that people are now unwilling to pay more to help the poorest in society. This entry was posted on Sunday, October 27th, 2013 at 15:41	and is filed under Climate Sock, Energy sources. You can follow any responses to this entry through the RSS 2.0 feed. Both comments and pings are currently closed.